In all of the professional learning that the Collab Lab facilitates, we always look for opportunities to expand our collaboration across schools, both in person and virtually, using Periscope, Facetime or Skype, and Google Hangout. In this post we'll highlight new collaborations we are enjoying this Spring. Our April In-Service Day gave us the chance to connect with our colleagues at The Academy at Forest View. The Collab Lab team planned a kind of hybrid EdCamp, giving all staff the opportunity to offer input on their needs and interest several weeks beforehand. We used the feedback from staff to pre-plan some of the session offerings, and we also gave staff the opportunity to suggest workshops the morning of the In-service day. Prior to the In-Service day, we got to thinking about the possibility of inviting some of our colleagues from the Academy at Forest View to join us, since, from prior collaborations, we knew that our staff had a shared interest in learning about, and/or sharing our practice, regarding social emotional learning and instructional technologies. We weren't sure if the logistics would work to bring teachers together from two buildings, but we figured it didn't hurt to try! We thought it would be great, even if just a few of the teachers could join us, and if not in person, via Google Hangout or Periscope. So, we presented our idea to Kara Kendrick, the Director of The Academy. Not only was she open to the idea, but after sharing the idea with some of her teacher leaders involved in planning their day, we were able to work out a plan that would allow for the entire staff from the Academy to join us at Elk Grove for the morning EdCamp! Staff from both schools facilitated sessions, and even student teachers and students joined in and presented too! As always, we documented our learning in each session using Google Docs so that we would all be able to access the notes for future reference, including for sessions we were interested in, but unable to attend. Feedback from the day was very positive, with some great suggestions for future In-service days. Almost all of the EG staff who completed our feedback form indicated how great it was to have this opportunity to get to know our colleagues from The Academy, and to learn with and from each other. We have already discussed plans to continue our collaboration with them during the coming school year! The visual below gives you a glimpse of some of the sessions. Check out this link for more details. A literacy research project done by our colleague, Katie Winstead, as part of her year-two Mentor Program project, inspired the Collab Lab to partner with Katie to host a book chat series. 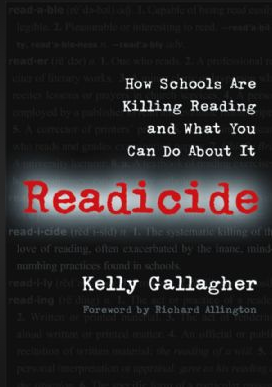 We will meet on Tuesday mornings in May from 7:40-8:05 in the Collab Lab and we will read and discuss the book Readicide by Kelly Gallagher. Each week we will share our key takeaways and questions. We will also reflect on our practice and, looking ahead to the coming school year, plan specific strategies that we can embed in our lessons to improve student literacy. All EG staff are welcomed to join us, and we have extended the invitation to our colleagues across District 214 as well who will be able to join us via Google Hangout. Look for future Collab Blog posts with updates on our Book chat series to see what we learn!